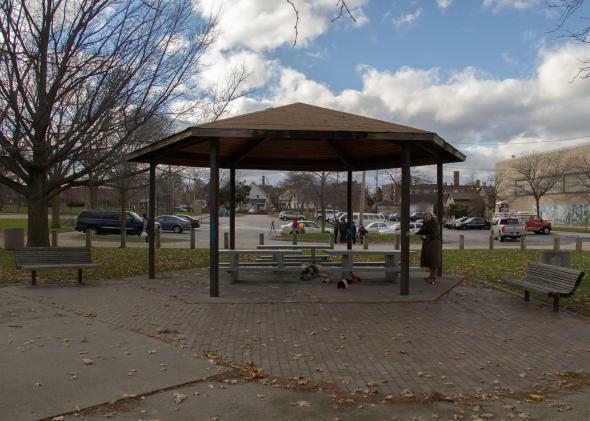 An unidentified person at Cudell Commons Park in Cleveland, Ohio on Nov. 24, 2014 stands under a gazebo where a memorial was set up for Tamir Rice, a 12-year-old boy shot by police on Nov. 23. Cleveland prosecutors have released the results of an investigation into the killing of 12-year-old Tamir Rice, who was shot and killed by a police officer. The Cuyahoga County Prosecutor’s Office released a redacted version of the 224-page report, which was compiled by Sheriff’s Department investigators, which examines the events that led up to and followed the shooting of the black youth in November. There is a lot of information in the report, but one of the most significant findings appears to be that the investigators could not find a single witness who heard police officer Timothy Loehmann issue a warning before opening fire, reports the Northeast Ohio Media Group. Loehmann has said he ordered Rice to show his hands three times before opening fire. Although Loehmann and his partner who drove the police car, Frank Garmback, refused to be interviewed by investigators, a fellow officer said Loehmann had told him Rice reached for his toy gun right before he opened fire. “He gave me no choice. He reached for the gun and there was nothing I could do,” Loehmann allegedly told a fellow officer after he shot Rice, according to WKYC. Fellow officers said Loehmann appeared to be distraught once he realized Rice was holding a pellet gun and that he was much younger than initially believed. Other officers backed Loehmann’s claims that the gun looked real. The investigators also talked to Rice’s friend who had given him the pellet gun hours before he was shot. The boy, who describes himself as Rice’s best friend, said he warned Rice to be careful with it because it looked real, claiming he had removed the distinctive orange tip that identifies the gun as a toy while trying to repair it and was not able to put it back on. Prosecutor Tim McGinty said he decided to release the report in the interest of transparency. “If we wait years for all litigation to be completed before the citizens are allowed to know what actually happened, we will have squandered our best opportunity to institute needed changes in use-of-force policy, police training and leadership,” he said, according to the Los Angeles Times. The full document is available here.